Do we really need any other reason to get the hell out of Iraq. The Iraqi’s do not respect us and we continue to lose valuable American lives. Please someone tell me why this Iraqi official fired upon U.S. Troops. While we may not like our government at times, and we may not like the strategies that they employ we must support our troops. Innocent men and women are dying all in the name of weapons of mass destruction that never existed. The Iraqi’s are tired of us being there, we really need to stop trying to police the world and spend some of our tax dollars on making it safer here at home. I’M DISGUSTED! Media Pundits and Political leaders seem a little upset that a politician did the unthinkable. He told the truth! 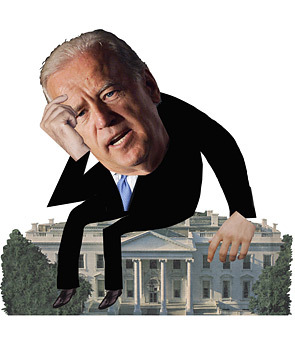 Many who are in the running for the VP slot for Barack obama are keeping tight lipped, some even going as far to say they would reject the offer. Senator biden however is letting it be known that he would proudly serve this county as Vice President. And Kudos to that man for being honest. Politricks can be a little weird at times, if you tell the truth you are a liar, if you lie you are merely protecting the public. Me personally, I don’t get it at times. I would rather say hey I’ll take the position rather than talk about how much I wouldn’t and then accept it later. What do you call that? A change of heart, I think not! Obama 08 Yes We Can Si Se Puede! What an amazing President we will have when the Fall Election commences. Amidst the devastation of the flooding in the Midwest Barack Obama put for action over image. Anyone can send kind words to the families in need but Barack chose to get down with the relief efforts and pick up a shovel and fill sand bags. That’s my President! YES WE CAN, SI SE PUEDE! So when John McCain says its tough to be prod of America there is no backlash but when Michelle Obama makes a similar statement the world is up in arms. This is the type of hypocrisy that angers me. Now I know that John McCain did not mean anything unpatriotic by his statements and how they can be viewed out of context. I understand this very much but what I do not understand is why it is so easy to afford him this understanding and not Mrs. Obama for her statements. We all have to do a better job at being objective, and stop hanging onto the trivial things and address what will make this country a better country. Get it — he was mocking Michelle Obama and her statement earlier this year that her husband had for the first time in her life made her proud of her country. “I’ll admit to you that it’s tough, it’s tough in some respects,” McCain said, seeming to lend credence to Michelle Obama’s observation. He observed that one of the ways to be proud of the country was to look at our history — and the sacrifices U.S. troops have made abroad. So now Obama’s daughters are Nappy Headed Hoes. I understand that art is the freedom of expression but this is utterly ridiculous. America has lost its values. Not only is the man’s wife allowed to be disrespected but now his two beautiful children as well. 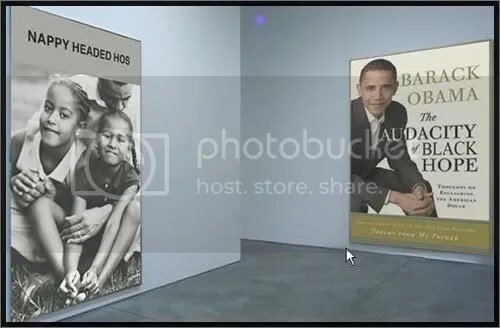 This photo is from the “Assassination of Barack Obama” exhibit. Last week it was that Barack Obama and Michelle Obama were exchanging “terrorist jabs”. Now they are calling Michelle Obama Barack’s “baby mama”. This nonsense is not going to stop obviously so the best we can do is combat these racist measures and attempts to smear the next President of these United States. I often wonder about the intelligence of the people who make such idiotic decisions. I am offended for the Obama’s. They are determined to smear Barack Obama and his wife at any costs, and they wonder why America is in the state it is currently. It is because rather than deal with real issues like health care, the economy, and poverty instead we like to divide ourselves along silly racially charged bigot lines. Clark was sounding mighty Presidential here. Seems like he would compliment Barack well and adds the experience of foreign affairs and military strategy. Thoughts?